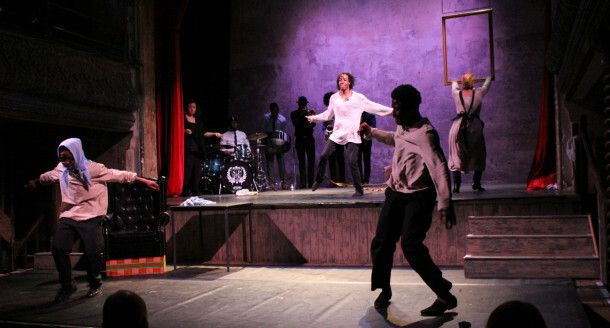 On Wednesday 1 March, East London Dance presented choreography by Jade Hackett at Wilton’s Music Hall in an evening of poetry, dance and music to celebrate the life and work of Harlem poet Langston Hughes. Produced by Poet in the City this exploration of Hughes’ life and artistic potency, remembered his remarkable voice through poetry performed by poet Kayo Chingonyi, music from brass and wood wind ensemble Kinetika Bloco and dance by Jade Hackett, creating a celebration worthy of a cultural king. The epicentre of Harlem Renaissance, Langston Hughes’ rhythmic, urgent poetry empowered a generation of new writers, with an aftershock that still reverberates today. His work was full of music and dance, and described the Black American experience over decades. Characterised by narratives of empowerment and a belief in humanity, he celebrated Black identity in a unique and powerful way. Performed to a capacity audience and accompanied by brass and wood wind ensemble Kinetika Bloco, Jade’s work; a series of solos based on Hugh’s short poems alongside ensemble piece The Duke Joint, first commissioned by Artists 4 Artists, brought the house down with a unique insight into the world and words of Hughes’ poetry. Jade also spoke passionately and eloquently about the influence Hughes has had on her work and her drive to create thought-provoking and politically relevant dance work aiming to push the boundaries of Hip Hop dance theatre and give the black community a strong voice within the arts.